Sagging or uneven floor: If the supporting beams begin to lean, they will cause the floor to adjust accordingly, resulting in sagging, sloped, or uneven flooring. Cracks: Because the lean will most likely result in the floor pulling away from the walls, it will incite cracks in the floors and walls alike. Wet basement: Leaning support beams can facilitate water problems in your basement by providing an entry point for moisture via cracks in the walls. Pest infestation: Not only do cracks attract moisture into the home, but they also allow insects and other pests an opportunity to enter your house. These are just a few of the problems that can result from unstable, leaning posts and beams. Leaning support beams compromise the structural integrity of your foundation, therefore posing a serious hazard. Because the underlying problem is most likely the settling of the foundation itself, investing in the proper foundation repair services as soon as possible is critical. To fully ensure that your home’s foundation is secure, you must address the problem at its root. 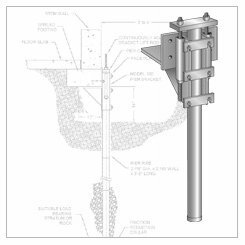 One method of remedying settling or shifting foundation is the installation of steel piers. These piers are driven into the ground underneath the foundation until they are secured in the stable ground far below the layers of shifting soil. Then, the weight of the structure is transferred onto the piers and they are used to support the foundation and ensure stability. Finally, the piers are used to lift the foundation back to its original level, relieving pressure that caused the beams or posts to bend or curve. The entire process is minimally invasive and can be conducted in almost any condition or season of weather. 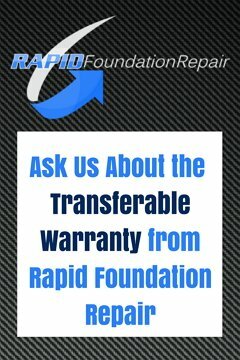 If you are experiencing problems related to your foundation, don’t hesitate to contact Rapid Foundation Repair. We are the experts on foundation repair in South Dakota and are happy to address any of your foundation correction and repair needs.